We are a family owned, licensed, and insured motorsports business offering top notch customer service and knowledge! McCutchin MotorSports, LLC opened in 2009 operating as a part time shop. After many years of surpassing goals, we were able to open the shop full time in October 2014 at our present location, 317 King Street. I graduated from MATC with a degree in Small Engines in 2004. Shortly after graduation, I was employed at Suter’s Speed Shop where I gained experience working on motorcycles specifically Harley’s and metric units, snowmobiles, and ATV’s. During the course of 10+ years of employment at Suter’s, I acquired a tremendous amount of hands-on knowledge from mentor, Steve Suter, who holds the world’s ice motorcycle drag racing record. We are a full service Motorcycle, ATV/UTV, and Snowmobile shop specializing in all major brands. From routine maintenance, repairs, parts, accessories, performance tuning/upgrades, engine rebuilding, and insurance claims, we are your one stop shop! You will find the best prices in Iowa County on parts and labor at our shop! 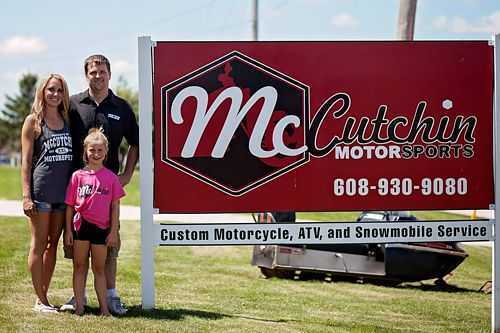 Our main goal at McCutchin MotorSports, LLC is to offer superb customer service with fair and honest prices. Our customers are #1 in our book! Thank you for visiting our website! Page Summary: McCutchin MotorSports offers motorsports, motorcycle repair shop, custom bikes and custom harley davidson. Products & Services such as power motorsports, motorcycle parts and accessories, custom motorcycle shops as well as custom sport bikes are also part of the scope of our business. We also specialize in custom street bikes, custom built motorcycles in Spring Green, Mount Horeb, Monfort as well as Blue Mounds. Other areas we serve include Belmont, Dodgeville, Mineral Point and Platteville. We also service Highland, Ridgeway and beyond.